For foreigners working in China, determining the applicability of individual income tax to one’s situation involves decoding a set of intersecting criteria and rules. Following this, you will need to calculate your precise liability and any applicable deductions. 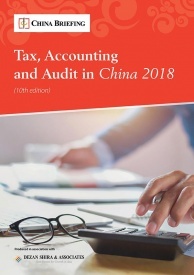 Lastly, consulting with a China taxation specialist can help optimize one’s overall income to achieve the most profitable package for you or your employees. 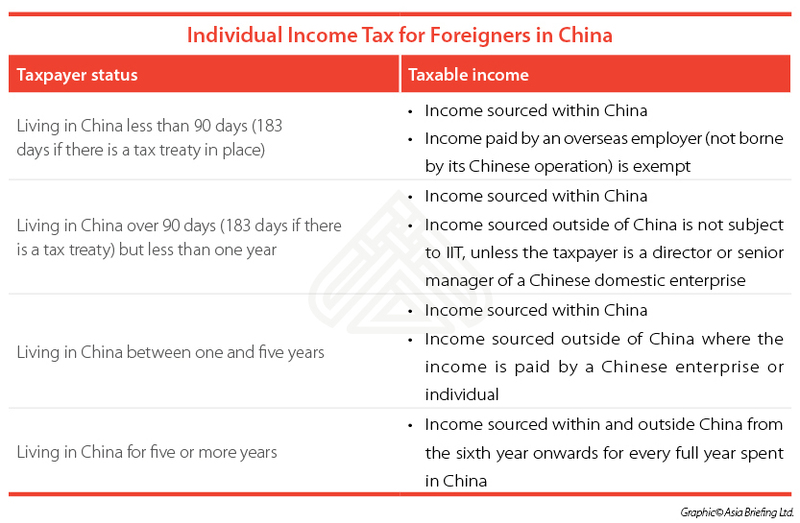 China’s Individual Income Tax Law recognizes 11 different categories of income, with a host of different deductions, tax rates, and exceptions applying to each of them. As our focus here lies with foreign employees, this article will only address the tax treatment of employment income, including salaries, bonuses, stock options, and allowances. Am I subject to Chinese tax? To determine whether a foreign individual working in China is subject to Chinese tax, it is necessary to look at how much time he or she has spent in China, what is the source of his or her income, and where his or her employer is based. 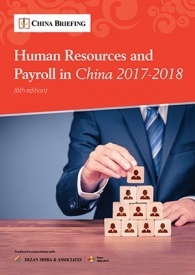 Income sourced within/outside of China is determined by the individual’s actual working period within China, regardless of whether the employer paying the income is based in China or not. How is “Time in China” calculated? A non-resident individual who has worked in China continuously or cumulatively for less than 90 days in a tax year only has to pay IIT on income for work done in China and for which the salary is paid by Chinese domestic institutions, entities or individuals. IIT on income derived from working outside of China or paid by a foreign employer outside of China will be exempt. If there is a double taxation agreement (DTA) in place between a foreign country and China, the 90-day limit may be extended to 183 days, depending on the relevant DTA. An individual who has resided in China for more than 90 days but less than one year during the tax year is subject to IIT on all China-sourced income, including income paid by both Chinese and overseas entities for his/her work in China. Income earned while working overseas (i.e., foreign-sourced income) in the tax year is not Chinese IIT taxable. An individual’s period of residency in China is calculated based on the calendar year, excepting temporary absences from the country of up to 30 days continuously or 90 days cumulatively – which are not counted toward the individual’s stay in China. A foreign individual who is deemed to have resided in China for more than one year but less than five years must pay IIT for income received from both Chinese and foreign employers for work conducted in China (China-sourced income), and also for income paid by Chinese employers during any temporary absences from the country. Income obtained from foreign employers for work done during a temporary absence is not taxable. A foreign individual who has resided in China for more than five years continuously may face new IIT liabilities identical to those of a resident individual of China, depending on the duration of his/her residency in China starting from the sixth year. If a foreign individual resides in China for one year in the sixth or any following single year, he/she would be considered a resident individual under the IIT Law and therefore liable for IIT on income received globally for that specific tax year; if the individual resides in China for less than one year in the sixth or any following single year, he/she is subject to IIT on only China-sourced income, and the One-year Rule applies. The five-year threshold will be reset if the individual resides in China for less than 90 days in any single tax year starting from the sixth year, in which case the “90-day Rule” will apply for that tax year. Understanding the “Five-year Rule” is especially important for foreign companies with expats working in China for the long-term as their IIT burden may be significantly reduced if their stay in China is managed properly. Like in most countries, individual income tax in China is levied at a progressive rate. The tax brackets and corresponding rates are shown below. To avoid the hassle of calculating the different parts of one’s income at different tax rates, the table below includes a Quick Deduction figure. This allows you arrive at the amount of tax payable by entering the full income into the highest applicable tax rate, and then subtracting the Quick Deduction amount. Foreign individuals employed in China are eligible to a standard deduction of RMB 4,800. On top of this, there are a number of allowances that may be deducted off an individual’s income, including the mandatory Chinese social security payments for foreigners. Note: at the time of writing, not all Chinese cities have implemented social security for foreigners yet. The tax authorities will only permit these allowances to be deducted if they are included in the employee’s contract. The employee needs to produce an official fapiao (receipt) every month for the expenses, in addition to meeting other conditions. Previously, we gave an overview of expats in China by country of origin, and residence in China. The next article in this series explores the tax benefits of including annual bonuses or stock options in an expat’s salary package. 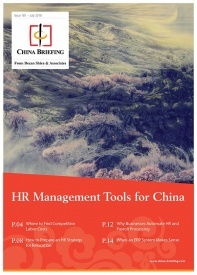 For China-specific income tax and human resources advisory, please contact china@dezshira.com. This article was originally published on January 28, 2015 and has been updated with the latest regulatory changes. This article is based on an issue of China Briefing Magazine, titled “Employing Foreign Nationals in China“. 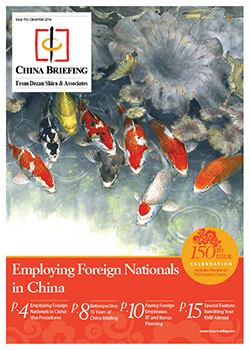 In this issue of China Briefing, we have set out to produce a guide to employing foreign nationals in China, from the initial step of applying for work visas, to more advanced subjects such as determining IIT liability and optimizing employee income packages for tax efficiency. Lastly, recognizing that few foreigners immigrate to China on a permanent basis, we provide an overview of methods for remitting RMB abroad. China Briefing is produced by Dezan Shira & Associates. The firm assists foreign investors throughout Asia and maintains offices in China, Hong Kong, Indonesia, Singapore, Russia, and Vietnam. Please contact info@dezshira.com or visit our website at www.dezshira.com. 1. Chinese permanent resident (green card): I heard that this year it is possible for scientists working for CAS are eligible to apply for green cards. Is this true? 2. I was also wondering if you could answer a world-wide income tax question. Do you know anything about the 5 year tax rule that states that foreigners living in PRC for 5+ years (without leaving for 30 consecutive days or 90 days in 1 calendar year) must pay tax on their worldwide income? I arrived in China on 24 January 2010 on an academic fellowship (with foreign income), then converted to a tax-paying, Z-visa/residence permit-holding resident (with China income) starting in November 2010 and have been employed with the same employer ever since (Chinese Academy of Sciences). I was away from China for more than 30 consecutive days from 2 March – 2 April 2010, and a total of 96 days in 2010 (I returned to China 24 December 2010), so I do not think 2010 counts towards my 5 years. I have not left China for more than 30 consecutive days or 90 days in a calendar year from 2011 to 2015, so 31 (or 24) December 2015 will complete my 5 year residency. Must I leave China for 30+ days before the end of the year (or 24th December) to avoid the “5-year rule”? Another thing: my employment in China has always been on a temporary, year-to-year basis. I never worked on a permanent basis and rely on soft money (grants and fellowships) to pay my salary. My contracts are never more than 1 year, and continuously renewed. In late 2013 (September – December), CAS stopped paying my salary for 4 months and I had no income at all. So, does this 5-year rule even apply to me? Am I correct in my understanding that the Chinese Tax Bureau have never collected any world wide income on a foreign resident for which this 5 year rule applies – but they do have the right should they decide to enforce it? 3. Does becoming a 5-year tax resident help me to apply for Chinese permanent residence card? 1) When the company wants to pay me for my fees, do I need to pay the IIT? 2) can they pay the fees directly to me in Singapore? If yes, do I have to pay the IIT in china? 3) if not possible to pay me directly in Singapore, when they pay the fees to me into my bank account in china, do I have to pay the IIT? Thanks and await your reply. Hi! Is Hong Kong part of the China tax region? If I live in Hong Kong and travel to Shenzhen daily (5 days a week, 20 days a month) does this mean I spend 10 work days in China per month (the day on which an individual enters or exits China is counted as a half-day)? Basically, is daily returning to HK considered leaving China for tax purposes? Can anybody let me know whether it is possible to get refund of income tax for foreign expert leaving China after two years of job completion. I have been working as a postdoc under the Chinese Academy of Sciences (CAS). I paid taxes (25%) from my monthly salary. Is it possible to get back lum sump amount before I leave China. Any advice will be highly appreciated. if i didnt finish my working contract here in china..do i need to pay my tax?.. Can foreigners avail of the Tax Residency Certificate (TRC) in China or is it even existent here? I have been filing my taxes since i came to China in 2007, but all that the Tax Bureau provides is a Tax receipt. Could you please let me know the procedure to get a TRC here in Shanghai. My CA back home keeps asking me to get a TRC even though i send him all the Tax Receipts. My work place (who employs about 150 foreign employees in China) pays my salary a month later than what the work period was. When I left them, they put two months together, and taxed them as one month. So instead of paying about 6500 income tax on 35000 gross pay for each month as normally done before. I had to pay close to 19000 tax on 70000 gross, which resulted in about 6000 less RMB going into my bank as I was expecting. I am wondering if what they did was legal? They told me that they had to do it because I would be no longer employed by them when I got my last month’s pay. They also said that this was acceptable practice. Monir: I heard that you can claim back the amount you (not your employer) contributed, but I was told you can’t claim back tax. I am an Indian coming to china for study of doctarate for four years, where my entire course fee is on scholarship from chine government scholarship. I will also receive a stipend from china scholarship for next four years. I am sponsored by my employer in india for study. My employer in india is also paying me my current salary in india in Indian account. In this regard, how will be my tax treatment. Whether I ll be liable for tax in india or china. Thank you for your inquiry. Please contact our international tax planning team at http://www.dezshira.com/services/international-tax-planning to identify your tax treatment. Thanks for the informative article! Wonder how much of it still applies nowadays, 2 years after the publication date of the article? Supposing most of it still applies, question regarding the 5-year-rule. Your explanation implies that after 4-5 years of living in China, to escape the worldwide taxation you could live 11 months in China and 1 month in Hong Kong for example (and keep a proof of the residence in HK). Do I understand that correctly or is my interpretation wrong? If a regular foreign employee who has an open ended wirking contract is laid off, how much compensation he is entitled to get? Especially that the employee have good performance rating ang laying off is due to cost down action of the company. Thank you. For a regular layoff, the foreign employee should be eligible for severance equal to his or her average monthly salary multiplied by years of service, subject to a variety of restrictions. For a wrongful termination, the employee could be eligible for double salary. If a company is on a tax blacklist, does this mean that they are unable to apply for allowances for workers? I just recently received an offer to teach English in China, and I was wondering if I have to pay tax as soon as my first pay cheque arrives? Here in the UK, we have to earn a certain amount before they start deducting taxes. However, if I am to get paid 10,000 yuan a month in China, and then have the tax taken away from my very first paycheck, and then a further reduction of 1000 yuan, then my actual pay would only amount to 6,500 yuan for the first month? it is like 35% of my pay went to their government. Is my understanding correct? I’m wondering about the steps to take to get the tax back that I have paid. I did hear that a foreigner is entitled to a percentage of the tax in which they have paid when they are leaving China for good. Any tips or points in the right direction would be greatly appreciated. Hi I am new to china and my employer basically has provided a monthly wage yet out of that I have to pay for all living expenses. I know I can provide fapio for House rental & management fees also School for my children. Yet How can you claim on MEALS – is this a set amount each day ? is it for business only ? Also Laundry – is this for all the family ie send you clothes out for washing no need to have a washing machine ? also Medical insurance – is this claimable ? When I asked my company to assist in the TAX advice I got a go get your own advice and you pay for it yourself. How is the 90-day stay determined? Continuously or accumulatively? I live in the United States and I am entering a contract situation where I am to provide artwork for a publisher. All the artwork will be done in the USA and delivered via a FTP Site. Meaning, I won’t physically be working in China – or even visiting for that matter. I’m wondering if my payments will be taxed by China? Hi, I am a U.S. citizen and work for a U.S. domestic company as a contractor (1099). If I travel to China on a Q2 visa, can I work remotely (via internet/phone call/email) during the stay? If not, what visa category should I apply? I noticed the Z visa requires a Chinese employer which does not work in my case. Thank you. Thank you for the great information. Is the two personal trips to original country allowed monthly or no mor than twice a year? My company has recently brought in higher tax free travel allowances for new staff, but says it cannot offer the increase to existing staff as it is against tax law to increase these allowances that are set at the beginning of the employees employment date. Therefore, existing employees must stay on the same allowances for the entire time they work here, regardless of whether they sign a new contract. Is this accurate? It doesn’t seem right, as it doesn’t even take inflation into account, letalone rising rental costs, which are way above inflation. Can you tell us if this true?! I have worked in China for 18 years and have accumulated a sizeable savings in my Chinese bank account amounting to the mid six figures in usd. I don’t have the certification of taxes paid for the full amount because it has been 18 years and many of the English training centers I have worked for are now closed. How can I go about transferring my money out of China now that I am ready to leave. Can I just go to SAFE to pay the taxes for the amount that is unaccounted for and take that taxes-paid form to the bank to convert to USD and wire the money out? Does this apply to L and M visas? Technically, visa type is not a factor to calculate IIT tax residency. Rather, it is spent on time spent in China per year.